This itinerary is for the restless Diva. I’ve walked this all before (my pictures below), and doing it in a day can definitely keep you on your feet. Luckily, there are plenty of tapa bars to keep you fueled! 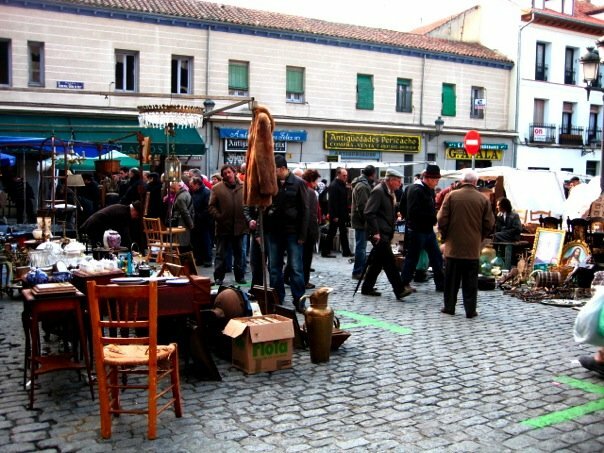 8 a.m. – If it’s Sunday, go to the El Rastro flea market. 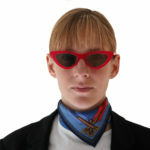 It is one of the biggest flea markets in the world and features amazing finds from antiques, to fashion, to electronics! Sometimes there are even small pets for sale! You will never know what you will find. Insider Tip: Get there early in the morning, such as 8am, to avoid the flocks of tourists and madrileños that frequent the market. Also, be on guard for pickpockets! If it’s not Sunday, Puerta del Sol is the best starting point. 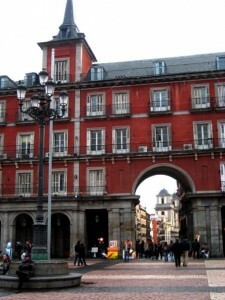 This plaza is one of the main centers of Madrid, with its streets splintering out to other famous landmarks. Puerta del Sol is full of shops, restaurants, cafes, and hosts the symbol of Madrid, a statue of a bear eating fruit from a tree (El Oso y El Madroño). 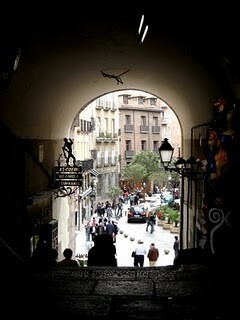 Spend time walking the busy alleys and streets that sprout from the plaza. Food to try: Churros con chocolate. I’ve heard some people eat this for breakfast, personally, my friends and I enjoyed the thick, chocolaty treat later in the day. Chocolateria de San Ginés, off Puerta del Sol. They’re famous for them! 11 a.m. – From Puerta del Sol, walk down Calle Mayor and follow the signs to Plaza Mayor, a beautiful square completely surrounded by old Spanish architecture. 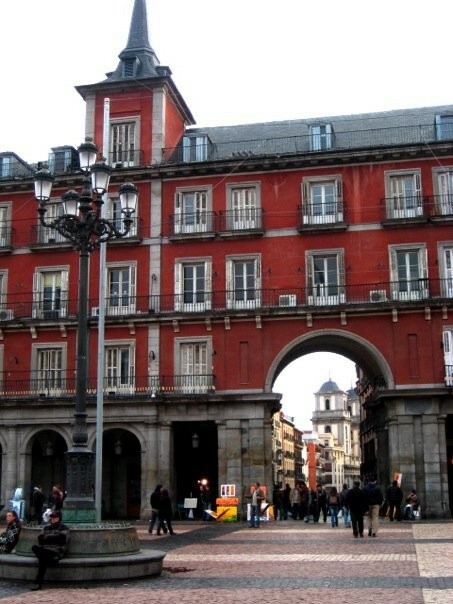 In the past, it was the center of festivities, bullfights, royal coronations and executions. Now, it is still a place for festivities, and the perfect place to watch street performers and tourists over a café con leche. 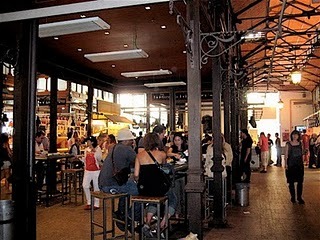 1 p.m – Mercado de San Miguel, a delicious farmer’s market featuring fresh fruits, fish, wine, and tapas, is right outside Plaza Mayor, off Calle Mayor. Sample some tapas, or make your own lunch from the variety of choices. The building that hosts the market is another stunning example of 20th century Spanish architecture. This can also be a fun venue for evening tapas and vino. Tip: Spanish lunch is later in the day, usually beginning around 2 or 3 p.m. Thus, dinner is also pushed back until closer to 10 p.m.
3 p.m. – Walk back to Puerta del Sol and up Calle de la Montera to find yourself on the bustling Gran Via, a shopping mecca and architectural haven. This street is one of the most important in Madrid and just celebrated its 100th Anniversary. Keep your eyes up to witness the detailed statues on rooftops and beautiful 20th century buildings. 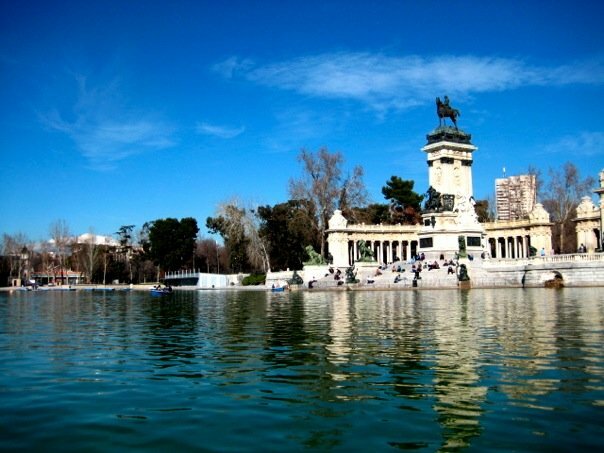 6 p.m. – If you continue down Gran Via and follow Calle de Alcalá, you will hit Parque del Retiro, the well-maintained central park. 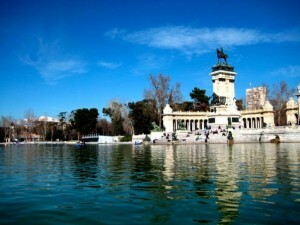 Featuring statues and fountains in every nook, this park was once the retreat for Spanish royals. Take a rowboat out on the lake, check out the latest exhibit inside the Palacio de Cristal, or stroll in the Rose Garden. 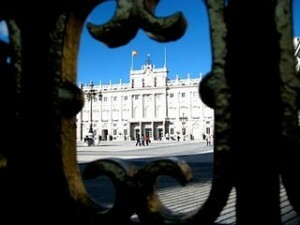 9 p.m. – Hop on the metro to see the Palacio Real (Royal Palace), located at the opposite end of Gran Via. Get off at Plaza de España to walk to the Palacio. 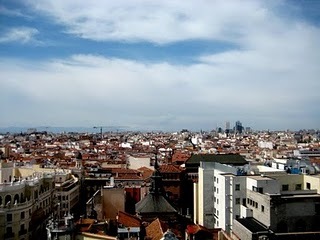 The surrounding area is beautiful, and one of my favorite areas of Madrid. It’s a perfect place to watch the sunset as you eat dinner at one of the restaurants looking out at the Plaza de Oriente, the area of gardens and regal statues in front of the Palacio. 11:30/12 a.m. – Go see a flamenco performance. (Tip: Eat dinner before. Tablao dinners are pricey for what you’re served.) 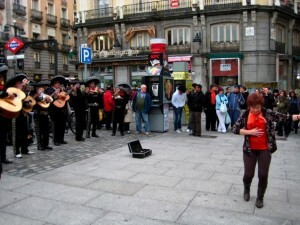 Traditional flamenco is supposed to be spontaneous and performed in intimate sessions. However, there are still tablaos who pride themselves on maintaining the art and feature fabulous dancers. 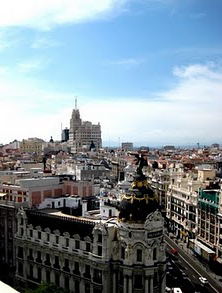 –Tapas: make your own Tapas Tour by hopping around different bars in the streets surrounding Puerta del Sol. Or go on a hosted Tapas Tour. 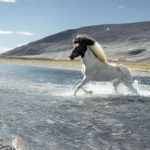 Multiple companies offer tours. 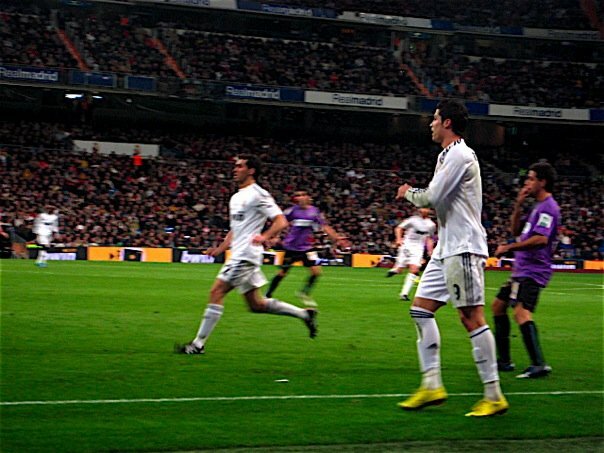 –Partido de fútbol: Watch Real Madrid, featuring some of the stars from the World Cup, battle it out in the towering Santiago Bernabéu Stadium. *Let me just state that I’m not a museum person. So these tips are museum-free. However, a simple search for Madrid will bring up multiple to choose from if that’s your forte. It sounds like you had a great visit! I will have to go to the El Rastro flea market on my next visit, it looks like a lot of fun!